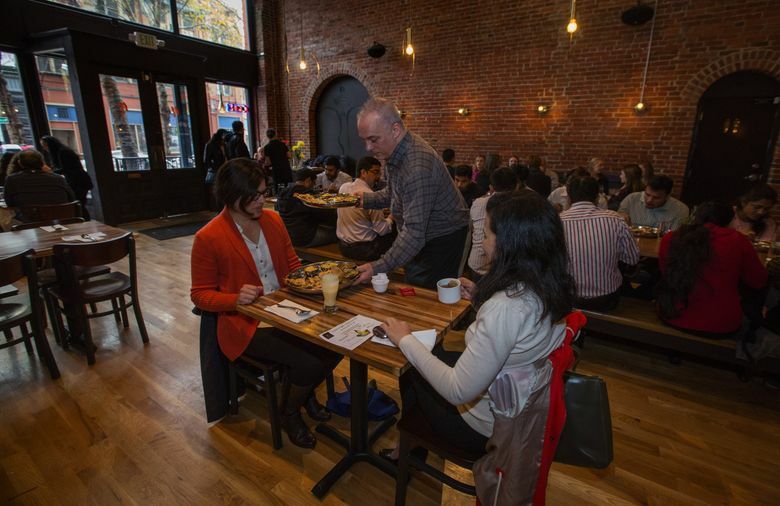 The Pioneer Square restaurant is celebrating its one-year anniversary, and the owners are planning a second venture. When I think of Nirmal’s, enchantment is the first word that comes to mind. It begins outside with the white lights that trim the trees along Occidental Avenue, illuminating the Indian restaurant’s entrance beneath one of the grandly arched portals of the historic Interurban Building, a stately terra cotta structure dating to the early 1890s. Inside, Nirmal’s is elegant in its severity. At night, filament bulbs cast starry light on the hardwood floors. Tiny candles twinkle on woodblock tables set against the brick-walled perimeter. A large vase of chrysanthemums graces a communal table that runs down the center of the long room. The bar, set against the back wall, has the look of an altar, albeit one devoted to spirits of the liquid sort: Old Raj gin and Amrut, the Indian-made single malt whiskey, are among the offerings. Hours: lunch Monday-Friday 11 a.m.-2 p.m.; dinner Thursday-Saturday 5:30-10 p.m.
Bangera and his wife, Dr. Gita Bangera, co-own Nirmal’s. The Mumbai natives settled in Seattle in 1997. When Oliver wearied of the incessant travel his job as a commodities trader entailed, they decided to open a restaurant. They enlisted Nirmal Monteiro, a longtime friend who catered their wedding 25 years ago, to head the kitchen. Costco and Trader Joe's offer liquor at bargain prices. Who does it better? Our experts test and tell you. Monteiro’s 30-year career as chef has taken him to Europe and Asia then back to Mumbai. The Bangeras have no previous restaurant experience. But Oliver, the front-of-the-house sorcerer-in-chief, has a gift for hospitality. He works the room, remembers faces and enjoys playing matchmaker. “If I know customers are from the same places, I introduce them,” he says. “So many have become friends.” One day he connected a young couple, newly arrived in town to work at Amazon and in need of housing, to a realtor he knew sitting nearby. They ended up lunching together. Lunch at most Indian restaurants typically means a bargain buffet. Lunch here is a full-service, sit-down affair with a short, value-priced menu, half of it vegetarian. The roomali roti ($10) is an enormous wrap that two eaters could happily share. Chicken (or grilled vegetables, if you prefer) fried potatoes, greens and a mustard-sharp sauce are all rolled together, burrito-like, in pliant, handkerchief-thin flatbread. 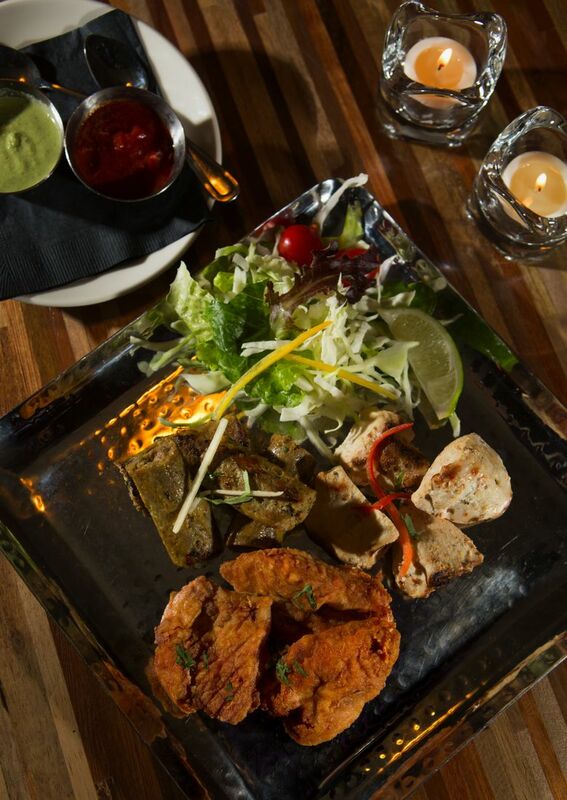 Each day the kitchen comes up with a different thali ($14 vegetarian; $16 with meat). The array of five small courses, from soup to dessert, is arranged on a tray with bread (naan or roti) and rice. Highlights on my thali included a creamy corn and bell pepper soup, vegetable curry bolstered with black cardamom, and a sweet carrot pudding that tasted alluringly like chai (more so than the chai tea). The dinner menu is more ambitious and just as vegetarian-friendly. The meal opens with a gift of papadum, brittle, carom-flecked wafers sprinkled with fresh cilantro and chili powder that prime you for other potent flavors to come. 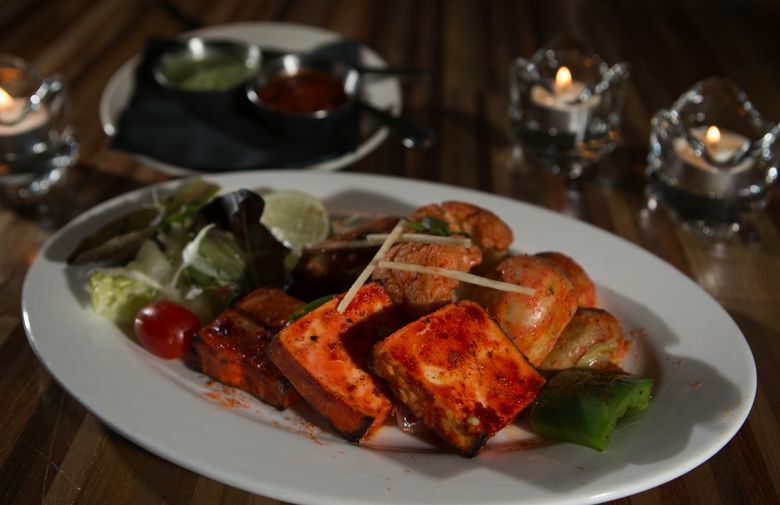 Monteiro wields the vast Indian spice arsenal with sophistication. His curries, chutneys and sauces seduce with subtlety. Deciphering all the ingredients is almost impossible. Ordering a side of fluffy basmati rice, or perhaps sharing a pot of steamed rice with vegetables (biryani) and a bowl of raita is a good idea to tamp down the peppery heat that blooms slowly but inevitably, even though it tends to be gently calibrated here. Definitely order bread. Use the buttery white naan or the herb-dusted whole wheat roti to scoop up a pair of smooth chutneys, one bright with mint and cilantro, the other a fiery tomato, or the luxurious spinach cream sauce smothering a chicken breast stuffed with paneer, lemongrass and more spinach (Murgh Taj). Coconut and tamarind ebb and flow in a beautifully synchronized Goan fish curry, made with chunks of pompano. (Watch for small bones.) 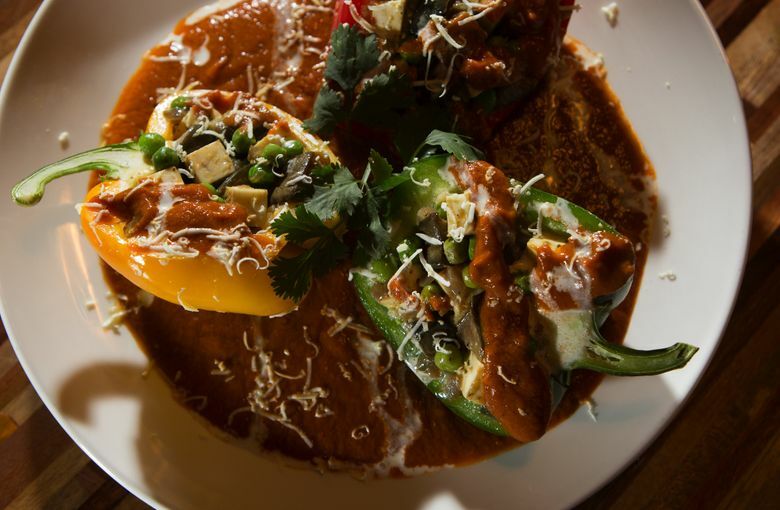 No bones to worry about in red and green bell peppers filled to overflowing with paneer, diced eggplant, peas and a cashew-thickened tomato sauce. That dish veers sweet but has plenty of smoky and spice to keep it on course. 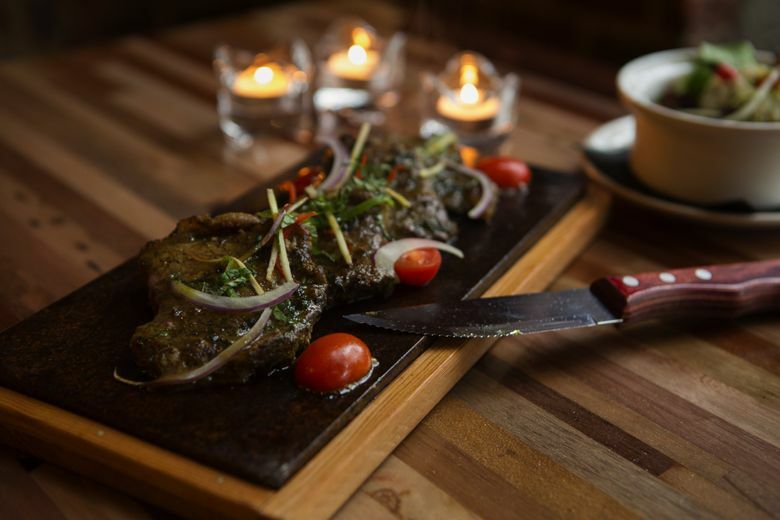 Steak (Patthar Ghosht) arrives in a cloud of garlic, ginger and cilantro sizzling on a slate platter with chile-stoked potato salad on the side. The meat had plenty of flavor, but a dull knife did it no favors and for $32 I expected a better cut than top sirloin. If you want red meat, the $19 tandoori rack of lamb (Ghosht Ke Panje) is a better deal, presented as five, extremely tender, lollipop chops pungent with garlic, nutmeg and Kashmiri chile. Deep-fried vegetable pakoras — button mushrooms, cauliflower, green pepper and potato slices crisply sheathed in spicy garbanzo batter — make a lively beginning to dinner. For dessert, cool things down with kulfi, a frozen, cardamom-flavored confection. The most popular dessert here is an Indian-American hybrid: a decadent wedge of chocolate layer cake served with a scoop of chickoo ice cream, a riff on Mumbai’s popular chickoo shakes, made with sapota, a slightly nutty-tasting tropical fruit. Nirmal’s will celebrate its first anniversary next month and already the Bangeras are planning a second venture with Monteiro. “One of the most successful pubs in Mumbai, The Elbo Room, was established by Nirmal,” says Bangera. “Seattle doesn’t have an Indian pub so we are creating one in South Lake Union.” They expect to seal a deal soon for the former Paddy Coyne’s space and open by next summer. Stay tuned.